I used to juggle all the time. I only managed to juggle 3 or 5 balls, as I found clubs like these to be somewhat more difficult to control. 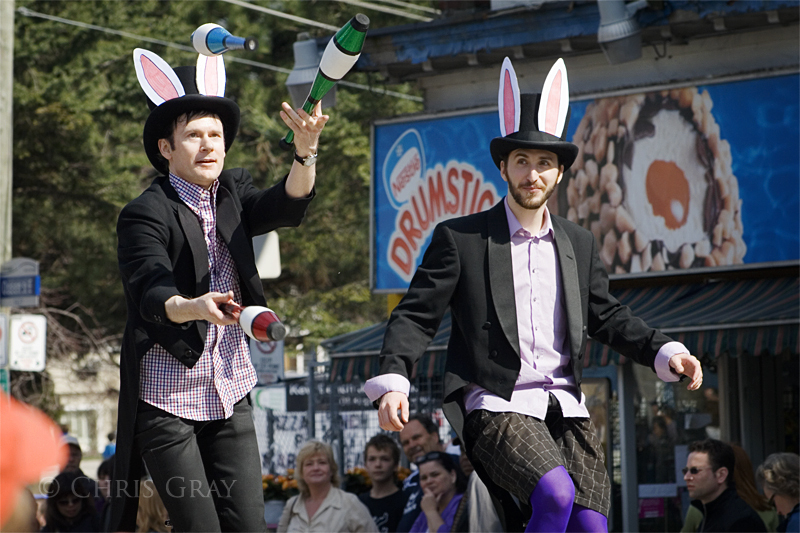 But, I never managed to juggle while riding a unicycle like this guy was doing at the Beaches Easter Parade. My hat's off to him for his skill. It's not often that it climbs above 21C in Toronto in April (that's 70F, for those still using the imperial system). But on Sunday, that's exactly what we had, for the third day in a row. 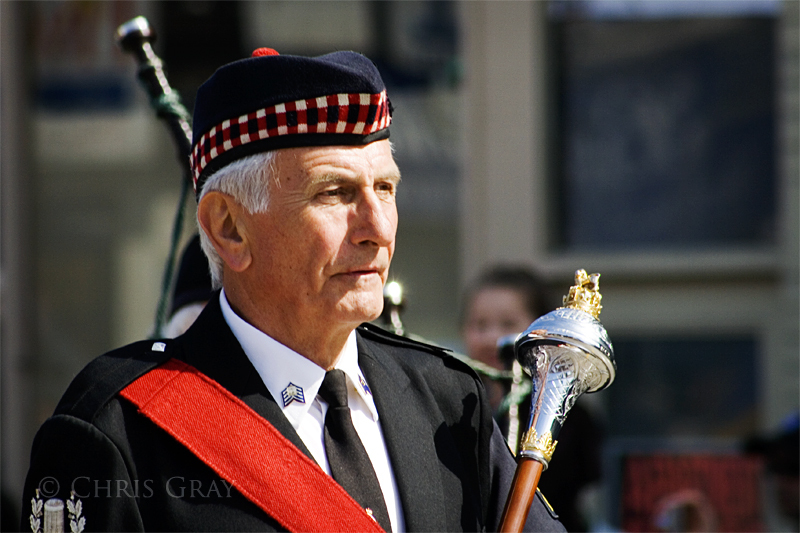 It was a fantastic weekend, and the crowds came out in full force for the Beaches Easter Parade. There were bands, there were jugglers, there were vintage vehicles, and there were politicians. Much candy was handed out to the kids in the crowd, and it was a lot of fun. I got this shot as a pipe band marched by. I have to confess, I love the sound of a pipe band. There's something about the bagpipes that just makes me happy, so when this band showed up, I really enjoyed listening. But I can't decide - do I like the colour version or the black and white? Both are wonderful, but for different reasons. What do you think, folks? 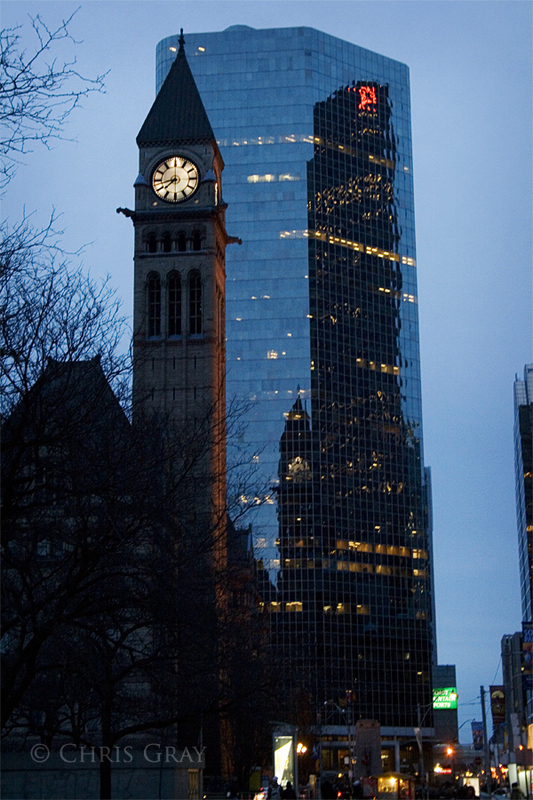 Old City Hall stands before the Eaton Center, which reflects the Simpsons Tower across from it. All three buildings are symbols of how this city keeps moving forward, keeps replacing old institutions with new ones. Old City Hall was replaced in the seventies, the Simpsons Tower how holds the Hudson's Bay Company stores, which have, in turn, been purchased by an American company. And the Eaton's Company no longer exists as a retail chain, after dominating Canadian retail for decades. Taken just before Earth Hour. Have I mentioned that I love the way we're getting light later and later into the evenings? Every day now, there's longer and longer light. It's wonderful. This page is an archive of entries from April 2010 listed from newest to oldest. March 2010 is the previous archive.